The 2018 Chevrolet Colorado vs the 2018 Toyota Tacoma is a rivalry that is long-standing among the mid-sized pickup class for years and without adding any of the baggage from the Honda’s, Nissan’s and the Ford’s, Colorado and the Tacoma go head to head each year in price, performance, safety features and capability that sets them apart from their mid-sized competitors each and every time. The 2018 Chevrolet Colorado comes out on top in interior comfort, materials, technology and just about every other aspect of each category. Colorado also wins in the safety features, performance, handling, towing and hauling which, may we add, was quite impressive, versatility, price, and off-road capability. It would seem that the 2018 Chevrolet Colorado vs the 2018 Toyota Tacoma took home the win on just about all categories except maybe that the interior trim lines are over the top tacky and the price tags are expensive making the monthly payments about what you pay for your mortgage each month. Ron Westphal in Lisle, IL has your new 2018 Chevrolet Colorado in stock. Come drive it home today! The all-new 2018 Chevrolet Colorado has the best in class interior design and styling of any mid-sized pickup and best in class comfort. 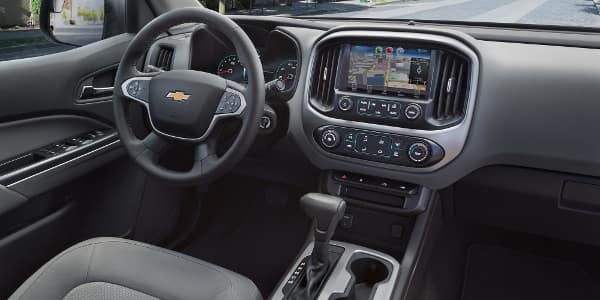 The standard gauges and controls are intuitive and right at your fingertips along with elegant and comfortable leather or cloth seats hand sewn for high-quality craftsmanship only Chevy can offer and each front row seat offers full-scale heated seats as well. 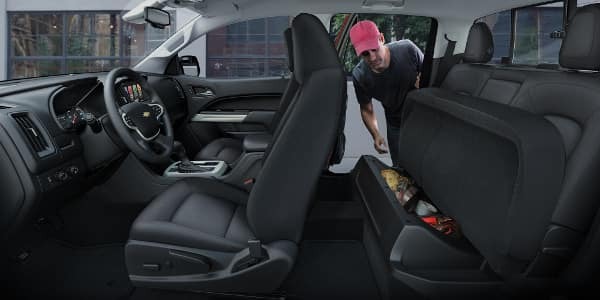 The cabin offers a huge center console that can double as an office that is large enough for a full-size laptop and the rear seats fold for extra cargo space that is hidden from view. The doors are triple sealed and the windshield and side glass is the liquid applied sound deadener for noise proof cabins to make the surround sound Bose premium sound system even better. The technology will amaze even the most tech savvy of us all with 4G LTE Wi-Fi, Apple CarPlay, Android Auto, Chevy MyLink, Teen Driver Technology and myChevrolet App. Safety features include forward collision alert system, Stabilitrak with traction control, lane departure warning system, standard on all models is a rear vision camera, lane departure warning system, high strength steel frame and cage, dual stage front and head curtain with side impact air-bags, OnStar and Chevy Complete Care maintenance and roadside assistance package included with every purchase. The 2018 Colorado vs the 2018 Toyota Tacoma is really no comparison when you look at all the features and Chevy availability. This winter the 2018 Chevrolet Colorado will serve you well on the Illinois roads. Come into Ron Westphal Chevy in Lisle, IL and drive home your new 2018 Chevy Colorado today! The 2018 Colorado vs the 2018 Toyota Tacoma rates far better in fuel economy getting twenty one miles per gallon in the city and twenty six on the highway than the Tacoma which puts the Colorado about six miles per gallon over the Tacoma which leaves you racing on by the fuel pump waving at your competition as they fuel up once again. The Chevy Colorado comes in three engine types the 2.5L I-4, 3.6L V6 and the 2.8L Diesel Turbo. The I-4 2.5L is the standard engine which gets two hundred horsepower, one hundred ninety-one lb. ft. of torque and can tow up to three thousand five hundred pounds. The V6 3.6L engine pumps out two hundred and seventy-five lb. ft. of torque and gets three hundred and eight horsepower and can tow a whopping seven thousand pounds. The 2.8L turbo diesel gets best in class towing for pulling a max of seven thousand seven hundred pounds and best in class torque pumping out three hundred and sixty-nine lb. ft. of torque and is America’s most fuel-efficient mid-sized pickup truck getting twenty-two MPG in the city and thirty MPG on the highway. If you want a mid-sized pickup truck that is capable, reliable, has off-road prowess, has best in class safety features and MPG, then come into Ron Westphal Chevy in Lisle, and check out the all-new 2018 Chevrolet Colorado! Why Us at Ron Westphal Chevy in Lisle, IL? 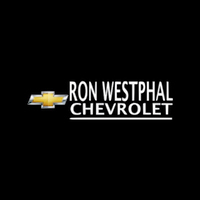 At Ron Westphal Chevy we pride ourselves on serving our community of Lisle, IL and of the greater region of Illinois as a whole. We have been a family owned and operated business for over forty years and continue to bring loyal and honest service to our community as a whole. Our professional and skilled sales and finance teams will save you thousands of dollars off your next vehicles purchase by offering you finance and lease specials combined with local and regional manufacturer incentives that our competitors can beat. Come in and see us today at Ron Westphal in Lisle, IL, where you become a part of our dealership family! Give yourself a treat by paying us a visit!